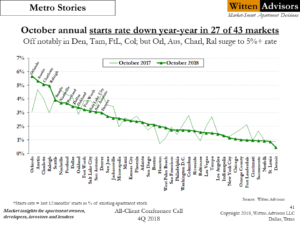 Excerpt from the 4Q18 Witten Advisory: The above chart illustrates apartment starts rates across our markets. Here, there are two major, and diametrically opposed, trends. First, starts have fallen off in two-thirds of markets compared to a year ago. Second, starts are at all-time highs and rising in four leading mid-tier markets – Orlando, Austin, Charlotte and Raleigh. The last 12 months’ starts in these metros will expand the local stock by 5 to 6% when completed….and will weaken owners’ pricing power in the future. The thin green line documents where starts rates were a year ago. In Denver, Tampa Bay, Fort Lauderdale and Columbus OH, this year-ago line is much higher than today’s production, shown in the dark green.